Julie and I arrived for the Galway County Clare Riding Adventure at An Sibin in time to get in a brisk walk. This is my second visit to An Sibin and I was excited to see that the neighbors still have their collection of gnomes and other decorative artifacts just down the road. Nicola told me that the neighbor is an older farmer, who has them out as a sort of conversation starter for the travelers who visit An Sibin. When we filmed at An Sibin before, we thought the gnome in particular was funny and Greg, our cameraman, wanted to take it with us on our travels. He’ll be pleased that no one else has taken it yet. This area of Ireland is a horse lover’s destination. It seems that everyone has horses and they are all kept outside, where they are allowed to truly be free and act like horses. Bertie and Nicola, our hosts, bring them in every once in a while for a ride. They keep the horses in various different large fields. It’s a nice life for a horse and they start training them slowly, but early, so the horses get used to the area’s boggy soil and being with people. After a morning Irish breakfast, we gathered our gear and went to a nearby field to catch our horses. Julie and I were a bit worried about who we’d be riding at first. If you travel and ride a lot, like I do, you are constantly challenged with adjusting to a new mount. 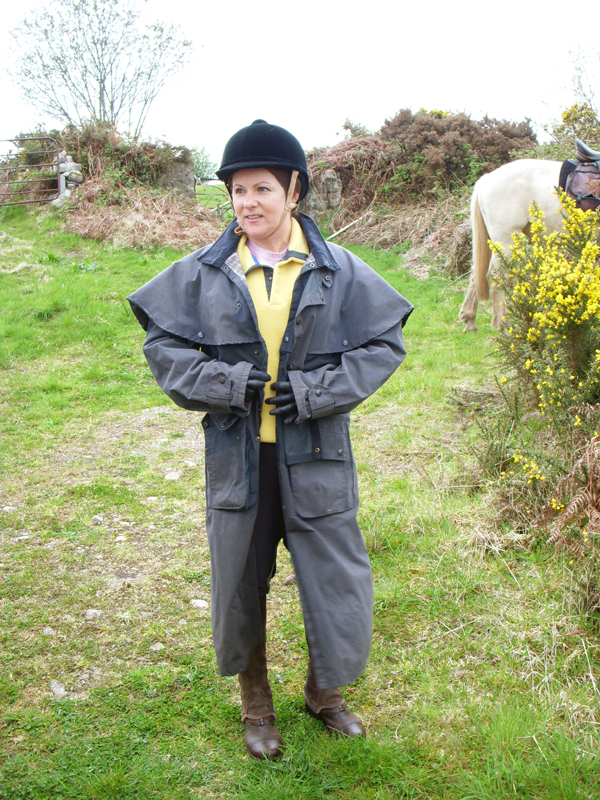 Julie has less experience in this field, but was just fine after riding a little on her Irish Cob. We didn’t canter right away. 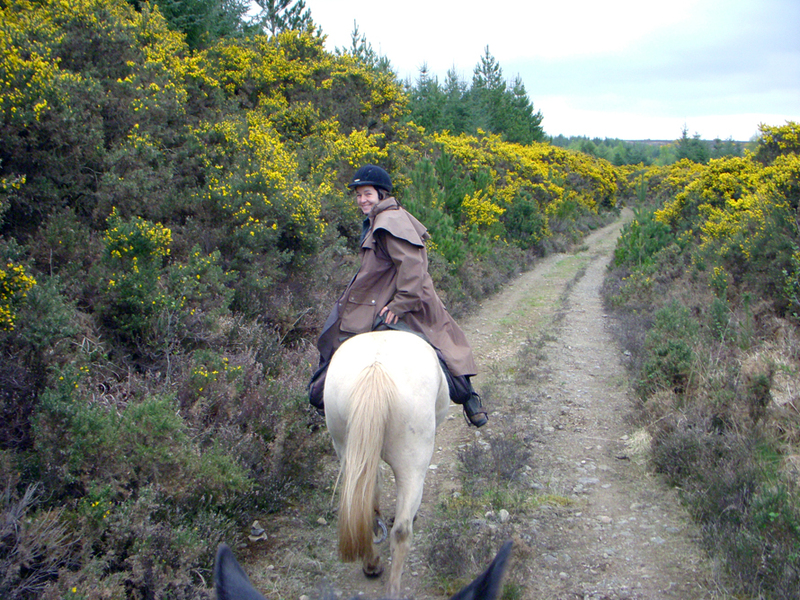 Nicola let us get used to our horses first, but as we passed through a long straight trail amid the dark, moss covered forest, we picked up the pace, feeling the strong Irish Cobs beneath us. These are the horses that have the very cool feathering on their legs. I’m a fan, as they feel very sturdy, dependable and strong. We rode through wide-open fields covered in peat and gorse, a beautiful and sharp yellow plant that blooms in the spring and smells like coconut. The gorse is everywhere, decorating the countryside. This area of Ireland is especially good for those interested in Irish history. You can ride by ancient ring forts and portal tombs—all sorts of archaeological wonders. 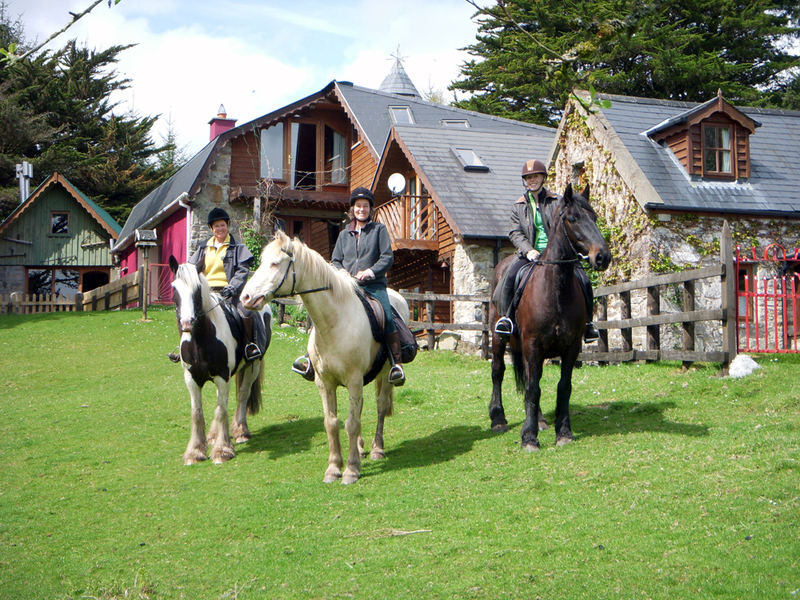 Learn more about equestrian vacations in Ireland with Equitrekking Travel and the Galway & Clare Riding Adventures.